A bright flash of gamma rays observed March 28 by the Swift satellite may have been the death rattle of a star falling into a massive black hole and being ripped apart, according to a team of astronomers led by the University of California, Berkeley. 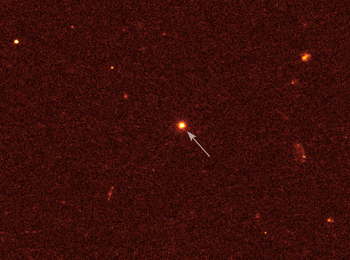 When the Swift Gamma Burst Mission spacecraft first detected the flash within the constellation Draco, astronomers thought it was a gamma-ray burst from a collapsing star and designated it GRB 110328A. 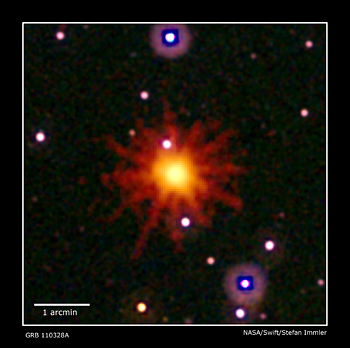 On March 31, however, UC Berkeley’s Joshua Bloom sent out an email circular suggesting that it wasn’t a typical gamma-ray burst at all, but a high-energy jet produced as a star about the size of our sun was shredded by a black hole a million times more massive. Bloom’s colleagues include UC Berkeley theoretical physicist Elliot Quataert, who models the production of jets from accretion disks, and UC Berkeley astronomers S. Bradley Cenko, Daniel A. Perley, Nathaniel R. Butler, Linda E. Strubbe, Antonino Cucchiara, Geoffrey C. Bower and Adam N. Morgan; Dimitrios Giannios and Brian D. Metzger of Princeton University; Andrew J. Levan of the University of Warwick, Coventry, United Kingdom; Nial R. Tanvir, Paul T. O’ Brien, Andrew R. King and Sergei Nayakshin of the University of Leicester in the U.K.; Fabio De Colle, Enrico Ramirez-Ruiz and James Guillochon of UC Santa Cruz; William H. Lee of the Universidad Nacional Autonoma de México in Mexico City; Andrew S. Fruchter of the Space Telescope Science Institute in Baltimore, Md. ; and Alexander J. van der Horst of the Universities Space Research Association in Huntsville, Ala.
Levan is first author of the companion Science Express paper, and leader of the Chandra and Hubble Space Telescope observation team. Bloom and his laboratory are supported by grants from NASA and the National Science Foundation.